We went to Montserrat first and beat the crowd for sure. Beautiful place with a lot of history. Back to Sagrada Familia and a audio tour. What an extremely well thought out and designed church. Putting Christ first always makes me feel great. A wonderful tour and an amazing tour guide! Monserrat was breathtaking! You could spend the day there and wish we had more time. Sagrada Família was as spectacular as promised! Our guide Vicente was the best guide we have had with many tours taken!! Extensive knowledge, kind, patient and humorous. He made everyone feel included and did an outstanding job! 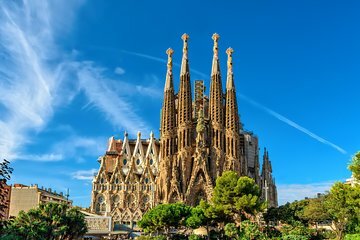 It is a huge undertaking to manage a visit to both Montserrat and Sagrada Familia in a single day. Reuben was an excellent guide, choosing timing wisely so we could see the holy Black Virgin and hear the children's choir in Montserrat. He kindly held our place in line so we could explore Montserrat. He knew a small local restaurant for an authentic Catalonia lunch. Later, he parked very close to Sagrada Familia so we could slide in right on time. Amazing, and exhausting day. Take water! My only suggestion is Reuben have much needed water in the van for such a long day. A full 10 hours! Our guide Carles was so passionate and knowledgeable about Modernism architecture in Barcelona that the two of us want to come back and learn more. Our trip to Montserrat on Sunday allowed us to attend a local church service that included the choir singing. The music was sensational and the acoustics in the church were outstanding. I definitely recommend this tour with Carles. This was a great semi private tour of Barcelona. The pluses were Montserrat and a terrific dinner at a family restaurant in Barcelona. The disappointments were not being able to get in the Sagrada Familia, because the tour guide was not aware of the time frame. Also, there was no walking tour in the Gothic quarter, but more of a riding tour of other sites in Barcelona. But it was a great day, because our guide was very friendly and informative. Our tour guide, Marivsz ( hope I spelled his name right) was wonderful. He was very knowledgeable, didn't rush through the tour. He was very pleasant! Had a private tour with Mauriz and we appreciated all the information that he gave us. He made sure that we were comfortable and customized our tour based on our needs.